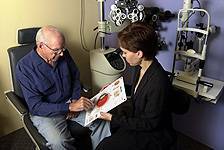 What is A Diabetic Eye Exam and Who Needs One? Since many diabetes related conditions show no symptoms until significant damage has already been done, early detection is essential. Early detection of diabetes related eye conditions is most successful for people who follow their eye doctor’s recommendation to have a comprehensive dilated eye exam once a year. This specialty eye exam consists of dilating your eye so that the pupil is enlarged, allowing your optometrist a wider window through which to inspect the retina for signs of retinopathy and other eye damage that could be caused by your diabetes. The comprehensive exam also includes a tonometry test, in which a quick puff of air is blown into your eye or a pressure-sensitive tip is gently placed near or against it. This measures your internal eye fluid pressure. If your eye doctor detects that your internal eye fluid pressure is higher than normal, this may be an indication of glaucoma. Statistics show that early detection through a dilated eye exam, timely treatment and appropriate follow-up can reduce your risk of significant vision loss from these conditions by as much as 95%. For more information or to schedule your comprehensive dilated eye exam, contact Dr. Lieberman at Professional Optometry, today.